CANBERRA is now an international destination, following today’s arrival of Singapore Airlines’ SQ291 from Singapore and departure for Wellington, New Zealand. 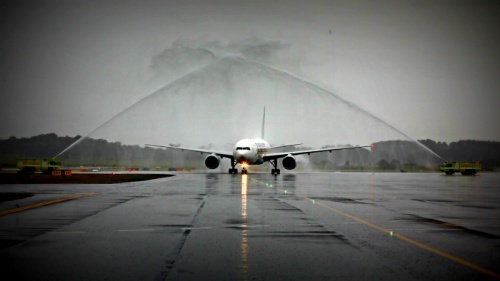 The Boeing 777-200ER with 240 people on board arrived to a water cannon salute and celebrations early this morning at Canberra Airport, carrying the Executive Chairman of the Capital Airport Group, Terry Snow, and his wife Ginette, en route to Wellington. They were welcomed by the Singapore Airlines Executive Vice President Commercial, Mr Mak Swee Wah, Canberra Airport Managing Director, Mr Stephen Byron and ACT Chief Minister, Mr Andrew Barr MLA. Mr Barr and Mr and Mrs Snow boarded the flight to Wellington following the official opening of the international departure gate. 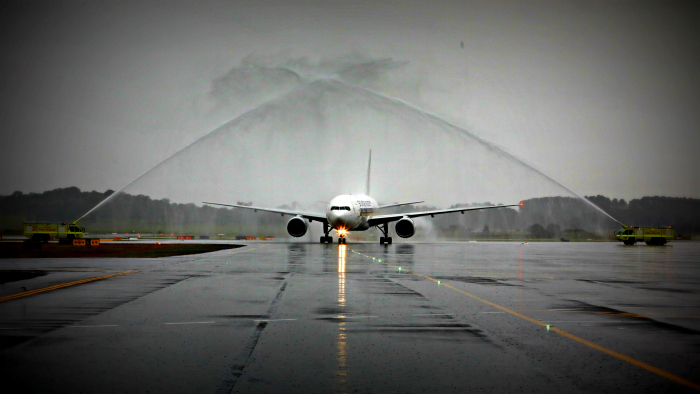 Today’s arrival marked the beginning of four services linking Singapore, Canberra and Wellington each Monday, Wednesday, Friday and Sunday. Stephen Byron said Australia deserved an international service into its national capital. “Overseas travellers, especially those from Asia, have expressed surprise that Australia is one of the very few countries in the world which does not have direct flights into the capital city”, Stephen said. Stephen said the beginning of the international service was also an economic story. “International flights into Canberra have enormous potential for producers and manufacturers to our north, west and south. It means, for example, that oysters harvested in the morning on the NSW South Coast can be on a lunch table in Singapore the next day”. “It also offers new options for producers who have previously used Sydney airport as a freight hub”. Mr Byron said the Airport was in discussions with other international airlines, and hoped to offer services to more international locations in the future.